It’s finally the Saturday night you’ve been eagerly anticipating. The guys are coming over soon and you’re getting ready to kick back, have a fun night out, so you reach down and grab your glass. What is that glass filled with? Beer? Vodka mixed with some fruity juice? Neither. According to the myth presented in the ad below, if you are a man, your glass is filled with only the best, whiskey. On a purely denotative level there are a lot of things one can pick out in this classic Jim Beam ad; most significantly, one can see a bald eagle with wings raised painted on wood, vintage photos and frames, an antiqued tint, and bold text that reads “CIVIL WAR SOLDIERS GETTING THEIR LEG SAWED OFF WEREN’T GIVEN A VODKA CRANBERRY,” which can initially be taken at face value as a factual statement. The objects depicted in this ad are telling of several different aspects of the myth it presents. On a connotative level, the wood grain, antiqued tone, and vintage decorations imply a sense of the past, and of tradition. The painted image of the bald eagle, an iconic American symbol, emphasizes this sense of the past by connoting a long-standing tradition of patriotism. Perhaps the most telling aspect of this ad, though, is the bold-faced text. As Storey states, “image does not illustrate text, it is the text which amplifies the connotative potential of the image” (123). Breaking down the text, there are several key phrases that amplify and add to the connotations already discussed. The words “Civil War” also have a connotation that is rooted in patriotism and the past; however, it also connotes the concept of war, brave soldiers, violence and masculinity. Another significant phrase is that which states, “getting their leg sawed off,” which connotes the concept of amputation. Taken with the context of the Civil War period, though, the idea of amputation implies significant pain that only a man could endure. Finally, the last bit of text, “vodka cranberry,” asserts the implication of whiskey as a manly drink by presenting us with a beverage that connotes the opposite: a fruity and thereby girly drink. The synthesis of all of these messages and signs reveals the myth that this ad so shamelessly presents: real men drink whiskey, and they always have. This ad is successful in communicating this myth because it plays off of many different implicit societal associations that we don’t even consciously perceive, and as Barthes states, “naturalization of the concept [is] the essential function of myth” (268). The ad invokes a strong sense of patriotism, which, in America, has a very implicit association with maleness, especially when considered within the context of the Civil War, a time when only men were soldiers. It also references vodka cranberry, a drink that has very strong associations to femininity, which effectively asserts whiskey as the manly, all-American man’s drink. The add overall has a vibe that provides a nostalgia for the past, a past that many of us in the present day never even lived; yet the ad makes us feel a strong connection to the past and roots our association to this brand of whiskey as something that stems back far into the past. All of the associations brought up in the ad are so ingrained in our societal understandings that the myth can be perceived without us consciously making the different associations. Looking at the ad, the myth that real men drink whiskey seems so obvious, so natural. The implications of this ad are nothing new in society. The myth presented by the ad implies the fact that hard alcohol is a manly drink, and whatever your drink of choice is defines your level of masculinity. But by asserting hard alcohol and whiskey as the positive, it makes any other choice appear feminine. This has the effect of reinforcing men as a dominant or superior entity in society, and asserts women as the meek and the mild. 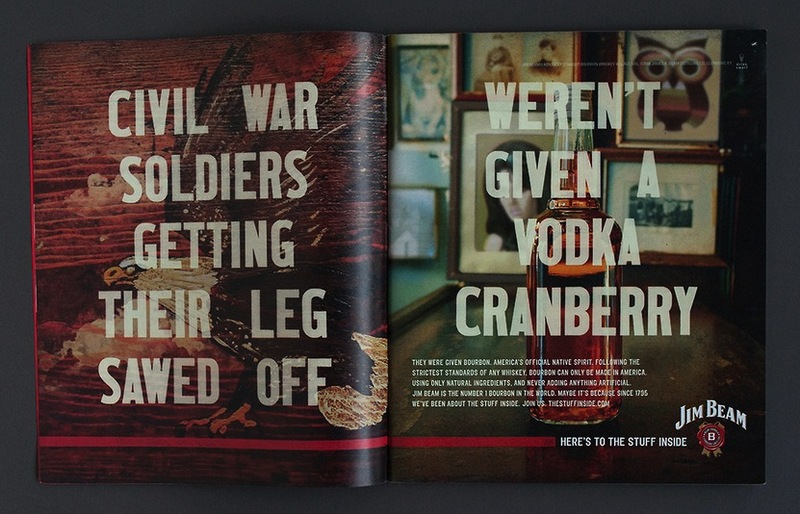 However, the myth presented in this Jim Beam ad is just that, a myth. Obviously, when we think critically it is clear that there are plenty of men who drink lighter alcohols, or don’t drink alcohol at all. Yet when we think of these men they do not appear any less masculine because of their drink (or no drink) of choice. I put the ad in there, is it not showing up for you? I meant to ask you about this in class last week, but I completely spaced. This is great. Honestly, this ad would make me buy Jim Beam whiskey. I love your analysis of the text and how it amplifies the images of the advertisement, especially the panel on the left, which displays and eagle rather than a more concrete representation of the civil war. I think its also a interesting to note that Jim Beam is “bourbon whiskey,” meaning it is produced in Kentucky according to the standards of bourbon production; and Kentucky was one of the civil war’s most important states, Lincoln famously said “I hope to have God on my side, but I must have Kentucky.” Thus Jim Beam associating itself with the Civil War has even deeper cultural connotations. Gosh this is so crazy that they are taking it all the way to the CIVIL WAR as if somehow we are supposed to remember that and associate it to masculinity…or as if we have any connection to it at all. Just the fact that its war and amputation and soldiers signifies it on its own. Advertising is crazy. Civil War dudes = crazy awesome facial hair.